3 Beds 1 Bath 1,038 Sq. ft. Call Anita McQueen, Remax Solutions, direct Cell phone 620-727-5647 Lovely brick ranch, corner lot, 3 bedrooms 1 bath, big living room, main level laundry just off kitchen, attached one car garage, wood fenced back yard to enjoy cook outs in private with patio, enclosed in the back yard is a nice storage building. 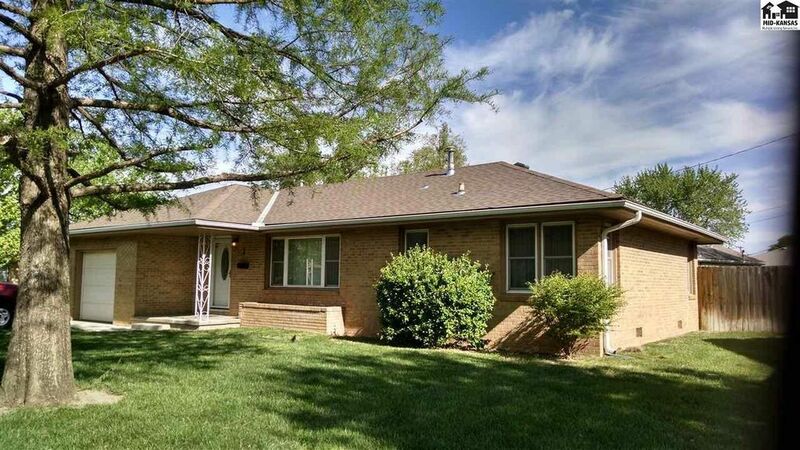 Graber Grade School, Hutchinson Schools, just north of 17th St. and East of Plum, So easy access to shopping, restaurants, hospitals, and schools. All one level. 1080 sq ft. living area. Move in ready. Refrigerator, Stove, and Washer / Dryer remain with the property. Auto Garage door opener for your vehicle, to drive in and easy unload close to kitchen area. Concrete Drive. Room on front porch for seating and enjoy your morning coffee. Established cared for lawn, includes shade trees. Room to plant flowers in the planter on the South side of home. Directions: 17th and Main West on 17th St.to Norman Rd. turn North to Sunflower Ave. Home is on the North East corner of intersection.